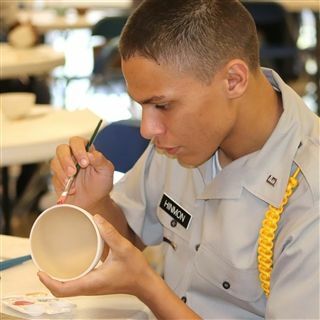 The RMA Eagle Bots are hosting a ‘Bowl Painting Event’ in support of Georgia Mountain Food Bank’s Annual Empty Bowls Luncheon on April 11, 2019, at 3:30 p.m. in Curtis Hall. This event’s proceeds will help fill the empty bowls in our community while increasing awareness of food insecurity. The Annual Empty Bowl Lunch is a fundraising event where community members can enjoy a great lunch while supporting a great cause. All bowls from the ‘Bowl Painting Event’ hosted by RMA will be used as donations at the Annual Empty Bowls Luncheon held on September 24, 2019 at Lanier Technical College, where guests will be able to make donations and choose a bowl as their memento, serving as a beautiful reminder to keep striving for the elimination of empty bowls and empty stomachs in our communities. Located in Gainesville, Georgia, the Georgia Mountain Food Bank's (GMFB’s) mission is to address hunger, health, and quality of life by serving those in need. An affiliate of Atlanta Community Food Bank, GMFB provides a vital link between sources of food supplies and hardworking community-based partner agencies who help get the food into the hands of families and individuals in need.